Meredith Graves sings and plays guitar in the band Shoppers from Syracuse, NY. You can find them on Tumblr, Facebook, and listen to they songs at http://shoppers.bandcamp.com. 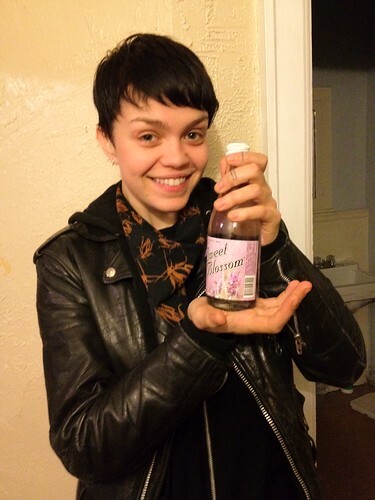 Shoppers played a show in Buffalo last night and I was so excited when I saw this lavender soda in Derek's cupboard. Watch the video to see what I thought of it. Stop whatever you are doing because finding this drink is your top priority. This is better than most drinks. Something to keep an eye out for. It's good but nothing special. Something you'd want to buy for parties. Fairly gross but at least we could finish it. Not anything we would recommend. Completely undrinkable. Each sip is a one way ticket to Barfville.